Presenting The Shadowhunter's Codex by Cassandra Clare & Joshua Lewis. Congratulations. You are ready to embark upon the righteous and rewarding life of a Shadowhunter. We have been chosen by the Angel to keep our world safe from the evil creatures we call "demons". And now you are one of us, and with this book, you will learn our lore and our ways. Angels, demons, faeries, vampires, werewolves, warlocks: they all exist, and they all must be managed and kept at peace. Welcome to our ranks, and study hard. This book could be the difference between life and death. The book that contains it all. Be it Shadowhunter law, their history, weapons catalogs, a short & detailed writing on Downworlders imaginable. Idris, the institutes, the Shadowhunter capital of Alicante, to the Silent City or the Adamant Citadel. 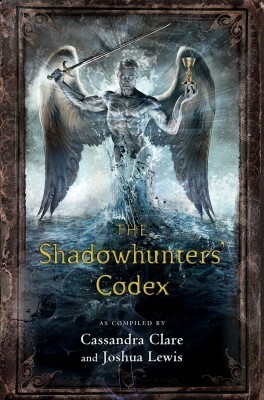 The Shadowhunter's Codex is the handbook, nephilim need to be aware of this hidden world around them. What to do and what not to do, the codex tells it all. Alongwith some running commentary from Clary, Jace &Simon providing the biting and silly humor to the serious textbook material of the codex. Coupled with some gorgeous artwork and illustrations, the codex tells the story of world before the beginning of the nephilim. Of what led Jonathan Shadowhunter to call upon the Archangel Raziel, his parabatai David establishing the Silent City and becoming the first Silent brother and Abigail Shadowhunter becoming the first Iron Sister. To a short description of the void and precisely, the Pandemonium City from where the demons appear to come from, or the history of the Accords.... This is a book to be cherished. Praises to Cassandra Clare and Joshua Lewis and all those who had a hand in the publishing of The Shadowhunter's Codex. "The necessary handbook for every Shadowhunters and fans of this series"